What sets Mighty Movers Tulsa Relocation apart from the competitors? Our service stands out amongst our competitors first because of an honest & affordable pricing structure. Second, Mighty Movers Tulsa Relocation has performed move after move with extremely low damage claimed as well as prompt loading & unloading of protected furniture items. No smoke breaks! We start by applying Furniture Protection (free of charge) to the necessary items in your home or office. Next we begin an efficient loading process to maximize storage on our 26' Moving Truck(s) to help ensure a one-trip relocation. Our movers are always noted for their constant motion & prompt attitude once the clock begins. It's this reason, Mighty Movers Tulas Relocation is rated at an A+ with the Better Business Bureau & has maintained an A average for the passed 10 years. This is an accomplishment that is extremely rare in a Moving Company in any area, not just Tulsa. Our reputation precedes us. If you are looking for moving companies in Tulsa, call us. Let us go to work for you! What does Mighty Movers Tulsa Relocation enjoy about moving? This is a great question because moving can be very stressful for the client. In fact we hear all the time from our clients: 'I am never moving again' or 'I don't know how you guys can do this everyday'. And that's a fair observation from their viewpoint. 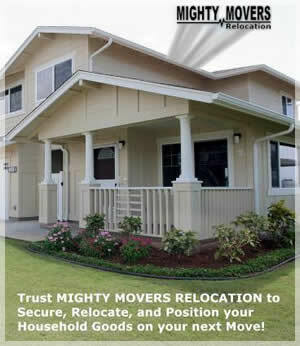 Mighty Movers Tulsa Relocation has simplified & provided a structure to how to turn your chaos into order. Our Tulsa Mighty Movers understand this so that eliminates the stress on our part. This gives our guys a heightened sense of professionalism that builds character from move to move. Our staff enjoy meeting new people as well as their many architectural designs. Some of your homes are truly inspiring to us! Believe it or not, our guys enjoy being physical and lifting & maneuvering through tight places. It keeps them fit & healthy! We encourage healthy diets because the food you eat is immediately on call when you begin working. Keeping physically fit, meeting new people, simplifying their moving, and seeing an awesome array of homes is our bread & butter. Moving is serious business & you deserve the best!